A major pattern change is in the works for the end of the week. This change in weather will make things feel like mid-December across the Midwest and will be a shock to system for many. The surge of cold air will also bring the threat for accumulating snow in a narrow band over parts of Iowa to lower Michigan. Models are beginning to come together this afternoon, but still some uncertainties to work out in the next 24 hours or. The storm system has yet to come on shore the Pacific Northwest, where it can be better sampled in the weather balloon networks and ground reports. Once this happens, the model discrepancies will generally become filtered out. With that said, we will not publish a full snow map at this time, but rather give a more general forecast. 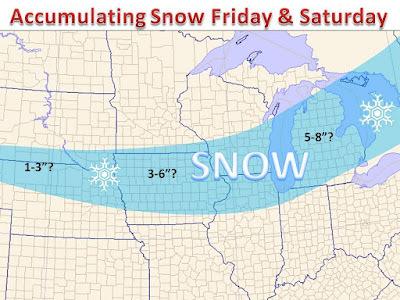 As the system emerges out of the Plains it is expected to strengthen and drop several inches of snow on the back side by Friday evening. 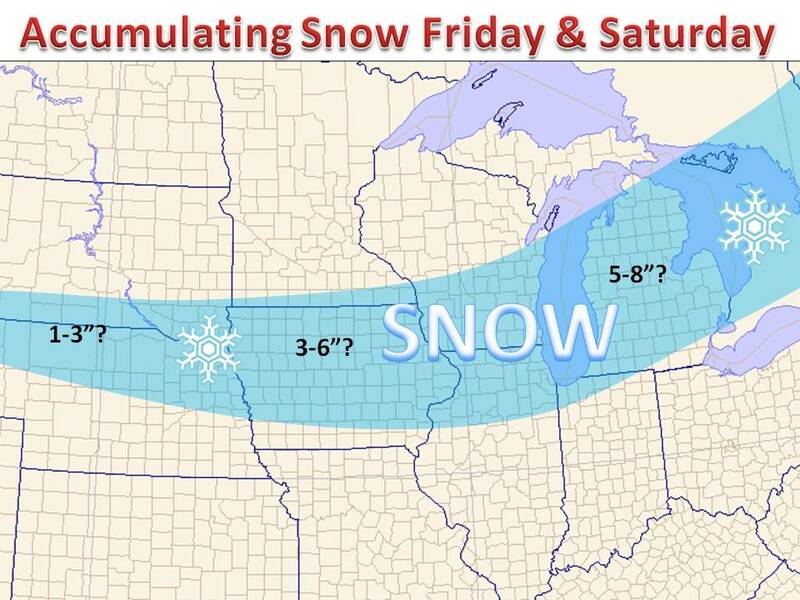 The heaviest of snow looks to fall from North Central Iowa to the WI/IL border to central Michigan. A half foot of snow will be possible in these areas, with more possible in SE Wisconsin and Lower Michigan as the storm ramps up and lake enhancement aids in the snow development. Be sure to check back for updates, our full snow map and forecast will be posted by this evening our early tomorrow afternoon. In the meantime, check out our social media platforms on the right hand side of the page.